Description: A general parody on the 1860 presidential contest, highlighting the impact of the Dred Scott decision on the race. That controversial decision, handed down in 1857 by Chief Justice Roger B. Taney, ruled that neither the federal government nor territorial governments could prohibit slavery in the territories. The burning question of the future of slavery in the United States was addressed by several of the contenders during the 1860 race. Here the four presidential candidates dance with members of their supposed respective constituencies. The music is fiddled by Dred Scott, the former slave whose suit precipitated the court’s decision. Scott sits on a chair at center. In the upper left is Southern Democrat John C. Breckinridge. He is paired with Democratic incumbent and ally James Buchanan, depicted as a goat or (as he was nicknamed) “Buck.” At the upper right Republican Abraham Lincoln prances arm-in-arm with a black woman, a pejorative reference to his party’s alignment with the abolitionists. At lower right Constitutional Union party candidate John Bell dances with an Indian brave. This pairing is puzzling but may allude to Bell’s brief flirtation with Native American interests. (For one instance of the use of the Indian as a nativist symbol see “Know Nothing Soap,” no. 1854-3.) At lower left Stephen A. Douglas dances with a ragged Irishman. Associated with Douglas in several cartoons (see “The Undecided Political Prize Fight,” no. 1860-22) the Irishman, here wearing a cross, may be intended as a reference to Douglas’s backing among Irish immigrants and allegations of the candidate’s Catholicism. 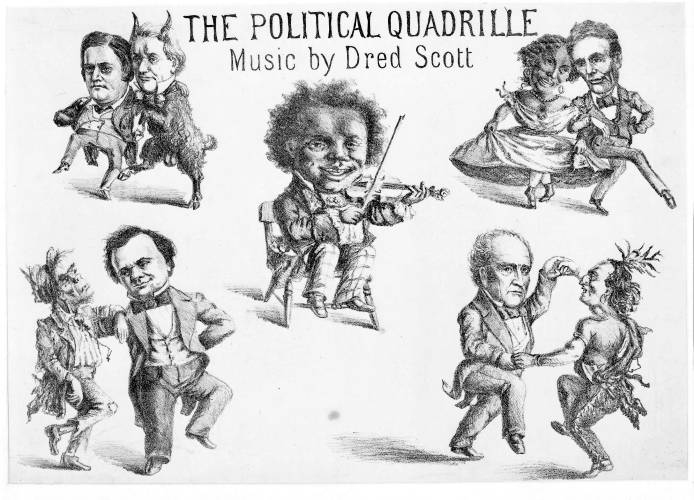 “The Political Quadrille’s” stylistic similarity to the “Undecided Political Prize Fight” and “Dividing The National Map” (nos. 1860-22 and 1860-24) suggests a common authorship.